Writer-director Chaitanya Tamhane’s Court, a much feted and celebrated film already, is a 360 degree appraisal of the criminal justice system of the sovereign, secular, democratic, republic that is India. It is that, but it’s also much more than that. Court is a sharp indictment of many things Indian — from the state’s corruption, inefficiency, apathy and illiteracy to the bigotry embedded in the Indian DNA. It deals with these serious and depressing issues but entirely in satire mode. Court doesn’t caricature our reality, nor does it harangue us with prescriptive chalk talk. It simply trains its lens on real-life parody as it plays out and shows us our world as is, without exaggeration or artifice. There’s just a daring and distinct cinematic language. There is at times that rare, moving work of art born out of that hard-won, elusive moment when the creator submits entirely to the creation and they become one. When nothing intervenes. It’s sublime and witnessing, experiencing it is almost spiritual. But rarely do we get the opportunity to witness that complete surrender and the resultant brilliance. I’ve watched Court thrice, and at every viewing I have wanted to bow respectfully to the annoyingly young Chaitanya Tamhane. He is 27. His Court is one of the best films I will see in my lifetime. Court was made on a budget of Rs 3.5 crore, none of which came from the film funding arms of the Government of India, though the Censor Board did demand two cuts. It went on to win the National Award for best film, 2014. The irony that this film comes wrapped in extends beyond the screen. The police, after thorough investigation, have filed a case of abetment to suicide, under Section 309 of the IPC, against Narayan Kamble. “These workers are fully aware of the hazardous gases that breed inside the sewers... No manhole worker with the experience of doing the job for five years, like the deceased, would go inside the sewers without any kind of protection to eyes, nose or skin,” the investigating officer Pradeep Shelke said. No safety equipment was found on or near Pawar and there were no wounds, injuries or signs of struggle on his body. According to the police, Pawar was provoked to commit suicide by a performance of Narayan Kamble and his troupe at Sitladevi Nagar on August 21. According to an eyewitness, one song performed by the accused coaxed and encouraged manhole workers to commit suicide by deeply inhaling the toxic gases found inside the city’s sewers. Pawar's post-mortem report has confirmed that the cause of death was the inhalation of poisonous gases. Vasudev Pawar, a resident of Sitladevi Nagar, is survived by his wife and daughter. This rather unremarkable brief news item is the film’s take off point. A case is filed and brought to the court of sessions judge, Sadavarte. Nutan (Geetanjali Kulkarni) is the public prosecutor, and Vivek Vora (Vivek Gomber) the defence attorney. Vora tells the court that the evidence is highly inconclusive and, quoting from the Halsbury’s Laws of England, states that the finding of suicide must be based on the evidence of intention of the accused to aid, instigate or abet to commit suicide. Kamble and Pawar did not know each other. They had not even met. Nutan states that the song in question suggested that the "one and only solution for certain sections of the society to gain dignity and respect was to commit suicide", and that it even suggested the method of suicide, the very same one by which the deceased took his life. Nutan stays focused on Kamble’s past record, to weigh in on the current case, all of which is spurious. Vinay stays focused on the lack of evidence in the current case. The judge rejects bail and sets the date for trial. Sadavarte has a reputation for speed. The previous year he clocked five cases per day. 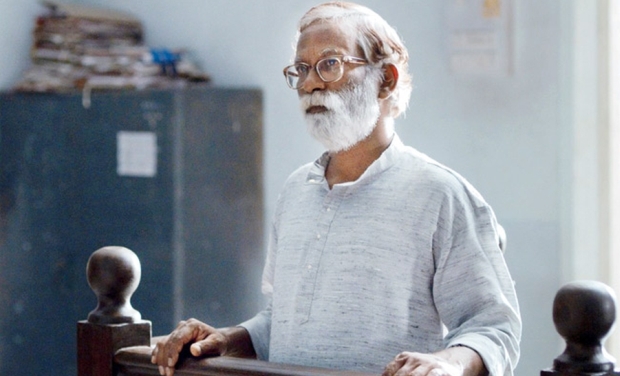 Narayan Kamble (played by real-life human rights activist Vira Sathidar), 65, is an activist of leftist persuasion. A former mill worker who was laid off without pension after the mill closed down, he takes tuitions, visits bastis and slums where he tries to rouse anyone who is listening — with his protest songs — against oppression of all manner. A portrait of Ambedkar usually hangs somewhere behind him. Neither he nor his troupe get paid for their performances. The trial begins. Of the two witnesses, one goes missing along with his statement, and the other turns out to be a stock witness. In between the trial proceedings we get pithy snapshots of other cases — a stolen imported watch, the hysterical case of Mercy Fernandes, passengers traveling in handicapped section of trains — all of which shine a light at our litigious nation, the backlog in courts, and leave us with the disturbing realisation that justice is a broken, forgotten cog in the giant, languorous wheel of our criminal justice system. We also get character sketches of the two lawyers. Vinay Vora, a potbellied, middle-aged man who walks with a funny waddle, specialises in criminal and human rights cases and is the founder-member of a legal NGO. When we meet him with his family, the conversation moves in delightful, colliding concentric circles that is all too familiar and funny. But Vinay lives alone, shops at a posh grocery store for cheese and wine, and listens to jazz in his car. The sounds, sights and flavours he likes to surround himself with in his personal life are far from the world of Kamble. Nutan lives much closer to Kamble’s world but her connect with him and his world is non-existent. Her concerns are personal and familial. Her politics too. She very casually says that Kamble should be thrown in jail for 20 years. He’s a worthless nuisance in court and her life. Vinay is a Gujarati and Nutan a Maharashtrian. A more crooked snook at our parochial cousins was never cocked before. Nutan and Sadavarte share a familiar world, speak the same language and are status quoists. They are culpable. Vora is the outsider — gently challenging authority and worrying about those below him. Nutan is deferential to authority and dismissive of those below her. The case meanders around the recoveries made from Kamble’s house — a rather mundane letter gets turned into a damning piece of evidence and two banned books lead to a hysterical non sequitur. Finally, when the deceased’s wife is called to testify, Sharmila Vasudev Pawar's monosyllabic responses to questions about safety gear, revelation about her husband's “cockroach test” unravel a tragedy that's so real, so shocking, yet so routine. Clearly visible in her testimony is the real accused, if anyone is bothered. Bail is granted, but soon Kamble is back in court, this time charged under the Unlawful Activities (Prevention) Act, for working with “potentially dangerous individuals” to threaten the unity, integrity, security and sovereignty of India. It's a non-bailable offence and he is placed in custody. Vinay may have taken the matter to the high court, but we don't know that. The sessions court is on summer vacations, and we go off with the judge on a family outing. Unlike the angst-ridden parallel cinema of the 1980s, and the choreographed razzle-dazzle of American court room dramas, director Chaitanya Tamhane has a light touch. He seemingly stays out of his film. That’s not true, of course. His film is deeply political. Tamhane’s seditious, insidious Court shows how fraudulent the right-wing rhetoric about “outsiders” taking the jobs of Marathi manoos is when Kamble himself is out of a job; it laughs heartily at the concept of freedom of speech and expression; and tells us how the British are still ruling us through their laws. But all this and lots more is carefully woven into the screenplay and load-bearing dialogue, ensuring that Court remains true to itself. That’s why everything feels real, seamless. Court says and shows us a lot, without wasting a moment. The film has no flab, this despite the fact that it has very long shots that linger long after the action is over. These are moments of meditation on what has just transpired, and on that mother of all ironies, Satyamev Jayate. About 70 per cent of the film was shot in the court room and the police station that were created. The rest was shot on location. Yet, every scene, every frame is constructed to convey something — often our inherent absurdity, like the fish tank in the police station, or the strange note-taking mechanism in court. Our rather routine craziness is also used at times to cut short a scene that gives the film a very cool zing. All the actors, without exception, are superb. And most are non-actors. My favourite remains Geetanjali Kulkarni. I can’t get over how fabulous she is as Nutan.